Twip.me allows you receive tweets to your favorite IM client. You will receive all your friends updates and direct messages right in your IM window and you will also be able to send tweets or dms. 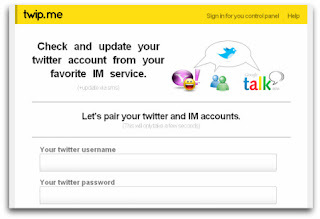 Twip.me is currently working on Yahoo Messenger, Windows Messenger and Jabber/Gtalk.